Native American and Artisan Coral Jewelry choices including Pendants, Necklaces, Cross Jewelry, Earrings and Rings. As our Coral Jewelry selection over the years dwindles, we have made a conscientious decision to work with sustainable Corals such as Apple Coral also referred to as Sponge Coral rather than the more prized material from endangered live Coral reefs. Our Apple Coral is a natural color which can be a bit orange perfect to compliment Southwestern Native American Jewelry and match many shades of Spiny Oyster Shell (not dyed deep blood red like Bamboo Coral is to simulate the rich reds of Mediterranean Corals). It comes from an Island off Vietnam in the South China Sea and is a fast growing coral, not an endangered species. The fishermen pull it up in their nets. 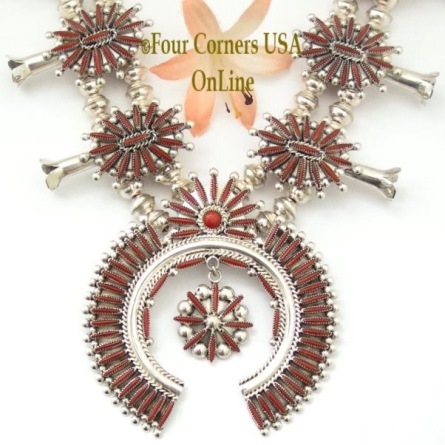 We do occasionally make exception to this rule specifically when high end Coral is used in culturally traditional Native American Jewelry that is passed from generation to generation.